Is there any paperwork or document for the mechanical systems of 81 October Lane, Aurora, Ontario? I need more information about the property at 81 October Lane, Aurora, Ontario. How ist the neighborhood, location and nearby amenities for 81 October Lane, Aurora, Ontario? I have questions about the roof, foundation, insulations and mechanical issues of 81 October Lane, Aurora, Ontario? I need more information about property details. What's wrong with this house? Is this a short sale? Is there any maintenance for 81 October Lane, Aurora, Ontario? What is this property worth in today's market? What are "closing costs", and how much? What steps should I take when looking for a home loan? What price home can I afford? Is my credit good enough to buy this house? What are the best mortgage options for me? How flexible is the seller on the asking price? 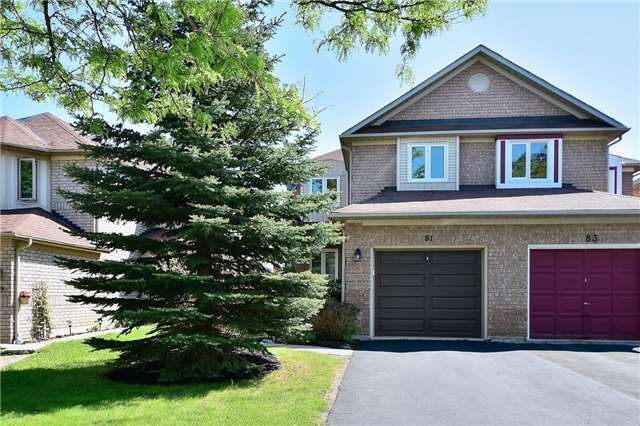 How low can I consider offering for 81 October Lane, Aurora, Ontario? Welcome To A Bright And Spacious Semi Located In A Desirable Aurora Grove Community Backing Onto Conservation Area. This Home Features Custom Built Kitchen With Granite Countertops/Custom Backsplash, Breakfast Area O/L The Pond With A W/O Onto Deck, Hardwood Throughout, Living Room With Fireplace, Custom Ensuite.Finished Lower Level With A W/O To A Private Fenced Extra Deep Backyard.Enjoy All Close By Amenities: Great Schools, Walking Trails, Public Transit. Included: Fridge, Stove, Dishwasher, Washer/Dryer. Light Fixtures, Gdo+Remote,Window Coverings, Hwt Rental Exclude: Basement Freezer, Dining Room Chandelier, Living Room Curtains. Freshly Painted, New Hardwood Upstairs.